← Issue 1 Now Available! Trying to pin down when I originally was exposed to Conan, the world-travelling barbarian created by Robert E. Howard, is tricky. It might have been watching edited versions of Conan the Barbarian and Conan the Destroyer when I was a kid. I clearly remember one summer in a library, devouring the paperback pastiches put out by Lin Carter and L’Sprague DeCamp and, at the time, feeling frustrated by the discontinuity between the stories. One of the most telling features of Conan is the recurring theme of civilization versus barbarity. Reading the Conan stories, it is clear that Howard truly believed that barbarism, while not necessarily superior to civilization, would always win out in the end. Frequently, Conan is able to better more educated swordsmen through natural talent, strength and speed. Fancy swordsmanship avails his opponents naught. But even when facing against other barbarians, such as the Picts in Beyond the Black River or Bêlit’s corsairs, Conan prevails, though in the latter case it is only because Bêlit chooses to spare him. Still, the lure of civilization is always present for Conan. He could, given, the opportunity, always return to the wilderness, but time and again he finds himself in civilization until he finally finds himself King of Aquilonia, arguably the pinnacle of civilization for the Hyborian Age. What still strikes me is the different kinds of stories Conan Howard penned. You have the palace intrigues of “The Phoenix on the Sword,” the piracy of “Queen of the Black Coast,” or the frontier battle of “Beyond the Black River.” Conan was a thief, a pirate, a mercenary, a conqueror, and a king. He possessed a vitality that dwarfed others, but was equally able to realize when he should cut his losses and run, be it running from magistrates in Argos, or fleeing a horror in the catacombs of a wizard. As Howard recounted, he felt the Conan tales came to him as a person might recount the stories of their life, not necessarily in chronological order, but as they occurred to him. All of the stories, however, feature explosive action and rich, detailed settings that varied greatly from story to story. The Zamoran city in “The Tower of the Elephant” is a distinct place, full of thieves and rogues, but so is Zamboula, whose streets cannibals stalk for two legged prey. To say that Conan is Howard’s most enduring creation is to court understatement, but not without help. He is iconic, in no small part thanks to the paintings of Frank Frazetta that, if they didn’t capture the literary detail of the character as described by Howard, did capture the imagination of viewers and help keep interested in the character alive. Likewise, while the merits of the various pastiches of Conan that have penned down the years vary widely in quality (and are often disputed as to what is the true canon of the character), without the effort L. Sprague Decamp and Lin Carter, there is the real risk that Conan would have languished, lost and forgotten, known only to a few aficionados of pulp literature. Instead, Conan’s lasting appeal can be seen in the stories that continue to be told, the games (video and tabletop) that continue to be developed, and yes, even the films and television series that have been made featuring the bold Cimmerian. Howard’s creation has been a deep well, indeed. Many of the original Conan stories are available on Project Gutenberg, arranged in a semblance of chronological order from his survival of a battle in the far North to his days as King Conan of Aquilonia. So what’s your favorite Conan story? 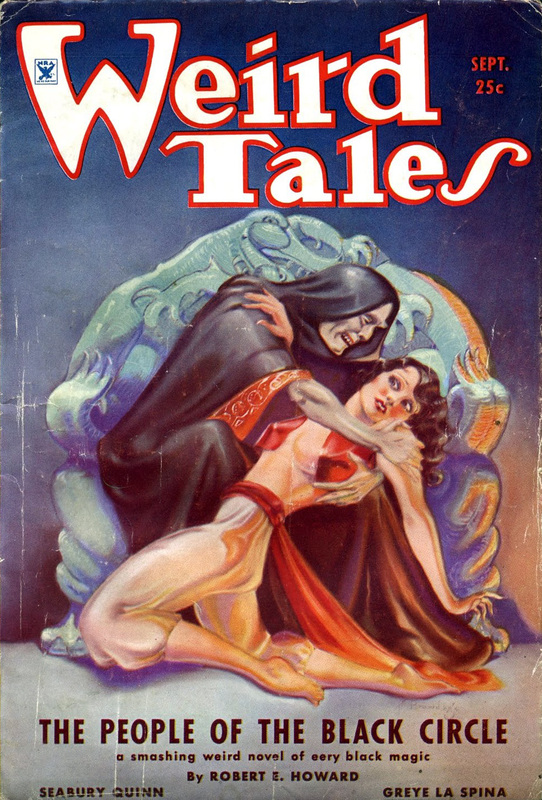 This entry was posted in Pulp, Pulp Appeal and tagged Conan, fantasy, pulp fiction, Robert E. Howard, seminal, sword and sorcery. Bookmark the permalink. A couple of thoughts on Conan and his lasting appeal as a character. In today’s Pulp Appeal Matt explores the lasting appeal of Conan. Some of what makes those pieces stand out: Yes, Conan’s there at the center in all his fun, snarly badassery, yet he’s a surprisingly more nuanced, sharply drawn character than we typically see, and most intriguingly, it’s not all about him. We get a more fleshed out, memorable ensemble and sense of the political intrigue setting the stage for all the blood and weirdness. Hell, in Black Circle and Black River, Conan’s arguably not the actual protagonist (rather the Devi Yasmina and Balthus respectively). Even the villains here are more fully realized characters, not just colorful pegs to be knocked down.